NASA Earth Observatory images by Joshua Stevens, using landslide susceptibility data provided by Thomas Stanley and Dalia Kirschbaum (NASA/GSFC). Story by Kasha Patel, adapted from a NASA release. Rainfall is the most common trigger of landslides around the world. If soil and rock conditions beneath a hilly surface are already unstable, heavy rains often cause mud, rocks, or debris—or all of them—to tumble down mountains and hillsides. Now, for the first time, scientists can examine rain–induced landslide threats anywhere around the globe every 30 minutes, thanks to satellite data and a new model developed at NASA’s Goddard Space Flight Center. The Landslide Hazard Assessment for Situational Awareness (LHASA) model is designed to identify where and when landslide hazards are developing and to understand long–term patterns in landslide activity. The animation at the top of this page shows potential landslide activity by month, as averaged over the past 15 years with the LHASA model. 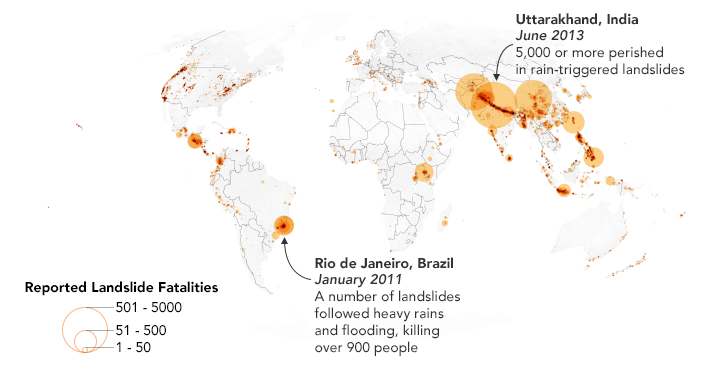 The images reveal a global “landslide season,” with a peak in the number of potential landslides in July and August in eastern and southern Asia—most likely associated with the Asian monsoon and tropical cyclone seasons. 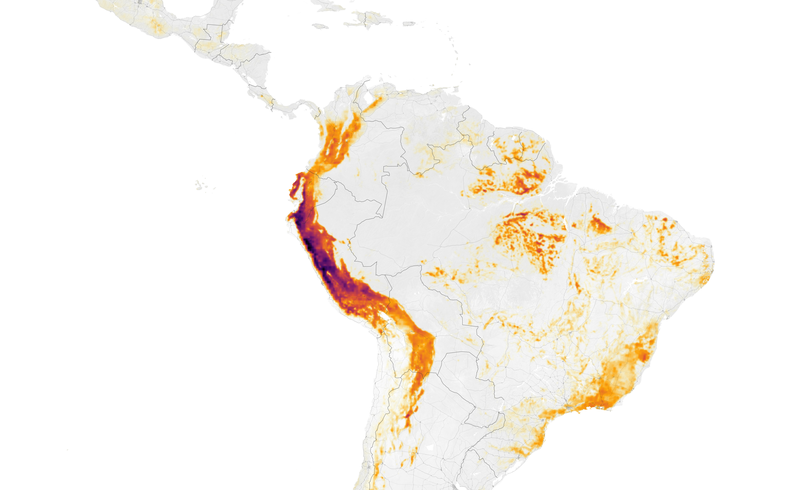 In the southern hemisphere, the high potential landslide activity peaks in Peru around March. In some areas, the model showed landslide activity that was not documented in landslide databases or news reports. 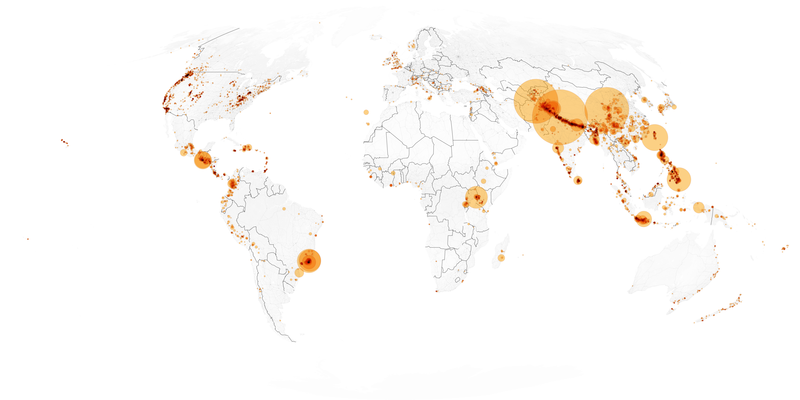 The map below shows 2,085 reported landslides with fatalities from NASA’s Global Landslide Catalog. The model showed more landslide activity in the Southern Andes, East African Rift Zone, Turkey, and Iran than was previously accounted for in the Global Landslide Catalog. Currently, Kirschbaum is leading a citizen science project to collect ground reports of landslides that will be used to validate the model. The LHASA model estimates landslide potential by first identifying areas with heavy, persistent, and recent precipitation. Rainfall estimates are provided by the Integrated Multi-Satellite Retrievals for GPM, known as IMERG, developed through the Global Precipitation Measurement (GPM) mission; ground– and satellite–based sensors provide precipitation estimates around the world every 30 minutes. The LHASA model compiles precipitation data from the past seven days and analyzes when each area exceeds a critical rainfall threshold. In places where precipitation is unusually abundant, the model blends the data with a susceptibility map to determine if the area is prone to landslides. 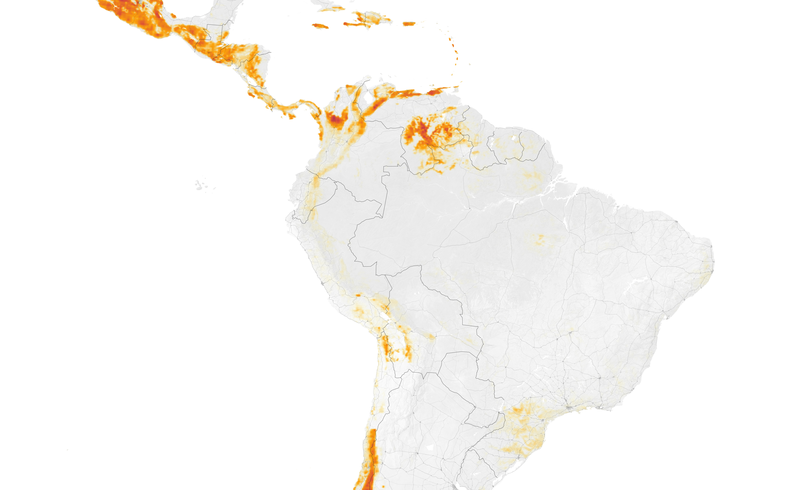 This global susceptibility map considers five features that play an important role in landslide activity: if roads have been built nearby; if trees have been removed or burned; if a major tectonic fault lies nearby; if the local bedrock is weak; and if the hillsides are steep. If the susceptibility map shows that an area with heavy rainfall is vulnerable, the model produces a “nowcast” that can alert researchers to a high or moderate likelihood of landslide activity. The model can produce new nowcasts every 30 minutes. 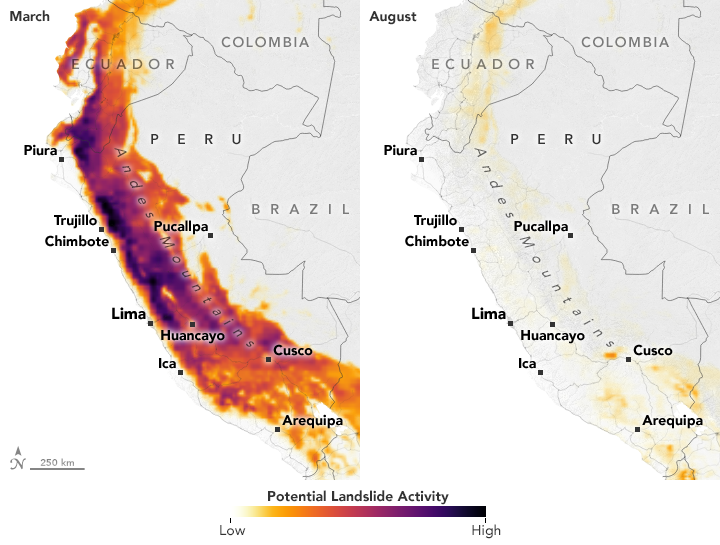 “The model has been able to help us understand immediate potential landslide hazards in a matter of minutes,” said Thomas Stanley, a landslide expert with Universities Space Research Association at NASA Goddard. Kirschbaum, D. and Stanley, T. (2018) Satellite–Based Assessment of Rainfall–Triggered Landslide Hazard for Situational Awareness. Earth's Future. NASA (2018, April 9). Landslides @ NASA. Accessed April 18, 2018. NASA (2018, March 22). New NASA Model Finds Landslide Threats in Near Real-Time During Heavy Rains. Accessed April 17, 2018. NASA Earth Observatory: Earth Matters blog (2018, April 18). Help NASA Create the Largest Landslide Database. Accessed April 18, 2018. NASA Scientific Visualization Studio (2018, March 22). New NASA Model Finds Landslide Threats in Near Real-Time During Heavy Rains. Accessed April 17, 2018.